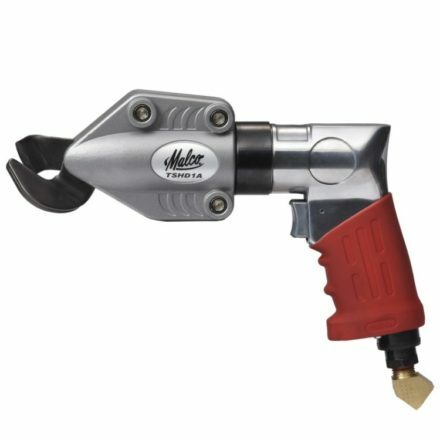 The Malco Locking Duct Stretcher pulls duct sections together and holds them in place while freeing both hands to align and install drive cleats. No need to adjust wheels! Simply place wheel located on move-able cam to one side of adjoining duct flanges. Turn handle downward to pull duct sections together, and lock in place. Greater wheel clearance makes capturing the ends of duct sections, even misshapen flanges, easier than ever. The versatile shape of the DS3 frame also lets you hook and pull duct from above as the drive cleat is coaxed along the remainder of flanged track. The durable all steel frame extends beyond wheel edges, making it safe to push, hammer and bend drive cleats as necessary to complete installation. An offset handle design eliminates knuckle contact with work. Locks on either side of duct connection. Durable steel frame makes it safe to push, hammer, and bend drive cleats.